Red Bull advertising executives thought they had a clever idea. They created an advertising cartoon which showed a crate containing Red Bull being being loaded on a ship. The captain walks by and asks what it contains. When he learns it is an energy drink, he is insulted pointing out they only drink champagne on his ship and orders it brought down. The deckhand says the drink gives you wings (an advertising slogan of the drink). 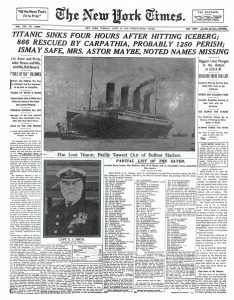 The captain responds by saying there is no need for wings on a ship, And then the crate reveals the name of the ship–Titanic–as the captain walks away. 42 complaints have been lodged with Advertising Standards Authority over the ad. 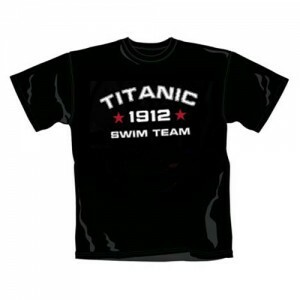 The Titanic Heritage Trust condemned the advert. Its founder, Howard Nelson, is considering filing a formal complaint. 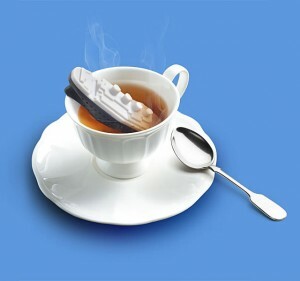 Now I am no fan of tacky Titanic themed products, but this ad does not get me that angry. I understand why people are offended. On the scale of offensive, I put it in the mild category. When the deckhand says it is an energy drink, Captain Smith scoffs at serving anything less than champagne. If anything, it pokes fun at the aristocratic mentality that abounded at that time. 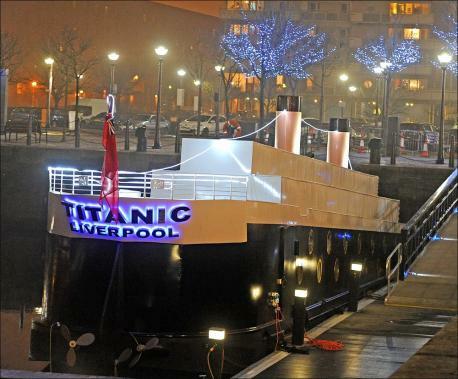 Whether it ought to use Titanic is another issue. Then again, they had to know using Titanic was going to draw ire from some. And perhaps that is what they wanted. I had not seen the ad, so I quickly tracked it down on YouTube. I actually watched both English and German versions. So they are getting eyes on the ad but whether it translates into sales, that is something they have to determine later. I actually thought the German version more funny than English. It is how it is said in German that makes it so. At any rate judge for yourself. The English version is below but if you want to see the German one, click here. Alfie Bubbles has just been outdone. 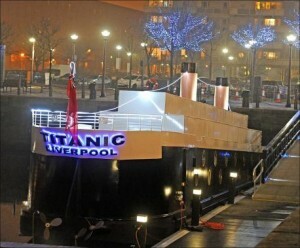 Bubbles owns the much criticized Titanic Sinking Hotel (made to look like Titanic sinking) in Liverpool. You can read previous posts here and here. Now it appears that a Titanic themed restaurant is being considered for downtown Dubai. And it will be shaped like a sinking Titanic. According to Al Bawada, the restaurant is one of the ideas being proposed for an apartment complex that would have restaurants and bars themed around Paramount movies like Titanic and The Godfather. Negotiations between the building owners and Paramount are under way. Rahal Anand, a property consultant with Damac, says it ultimately is up to Paramount what shape the proposed restaurant would look like. Damac reminds the proposal has not been finalized but they see it the shape of a ship sinking. Oh goody. I could see the restaurant shaped like Titanic in all its grandness. Shaping like it is sinking is tacky. Sure some will get a kick out of it (just like some do with Bubble’s) but many will find it off-putting. Sinking ships are not something amusing (even on Gilligan’s Island). It conveys the wrong image about such things. Paramount, whose name is being attached to all this, ought to realize this. Make it a classy representation of a grand ship and people will like it. Show it sinking and your public relations team will be putting out fires on that one. You can comment on this posting. All postings subject to approval to prevent spam.